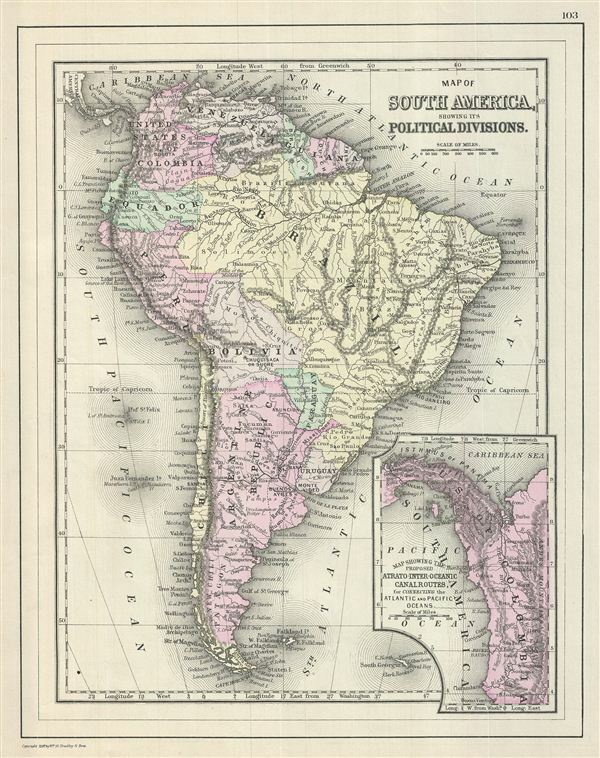 This is a fine example of William M. Bradley's 1887 map of South America. It depicts the whole continent from Panama to Cape Horn, including the Falkland and South Georgia island groups. It denotes both political and geographical details. Features surprisingly accurate detail of the interior of Brazil and the Amazon Basin. An inset map in the lower right quadrant depicts the Isthmus of Panama entitled 'Map Showing the Proposed Atrato-Inter-Oceanic Canal Routes, for Connecting the Atlantic and Pacific Oceans.' Work on the Panama Canal would begin in 1880 and be completed in 1914. Various towns, cities, rivers and an assortment of additional topographical details are noted. Map is color coded according to regional and political boundaries with elevation rendered by hachure. Copyrighted 1887 by Wm. M. Bradley & Bro., for issue as plate no. 103 in the 1887 edition of Mitchell's New General Atlas. Very good. Map of Colombia, Peru, Ecuador and Argentina on verso.